This striking Gibbs Wooden Garden Obelisk is constructed from Scandinavian Red Pine. Its main vertical timbers are 35mm square and all connections are bonded with high quality waterproof adhesive for durability and strength. The Gibbs can be topped with our standard ball finial, acorn or Saxon finial the choice is yours. The Gibbs is an elegant tall garden Obelisk that stands 180cm tall and is 50 cm square at the base. The Obelisk goes back to early Egyptian times where large and small monolith structures were built upwards, reaching towards the sky and into the heavens. In the 1700s, shorter, more compact obelisks became the vogue, in European cemeteries and gardens, eventually becoming the airy, latticed obelisks, of today. 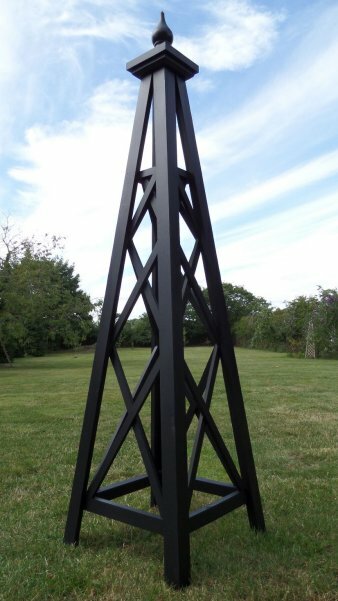 Obelisks are typically found in more formal garden layouts creating a focal point in the garden, all year-round. 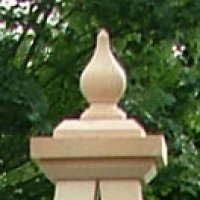 Statues, obelisks, fountains and special trees and shrubs are often used as points of interest in gardens and since your obelisk will be a focal point in your garden, you'll want to take your time in choosing the correct one for your garden. bases of multiple obelisks in the garden will maximize space and adds vertical interest to the garden. By growing plants with colourful blossoms up them you will attract butterflies, bees and other pollinating insects to your garden, which ensures a more productive vegetable or fruit garden. 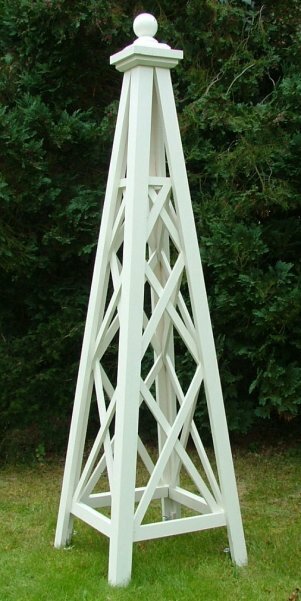 Garden obelisks can stand as a regal focal point in your rose or flower garden. 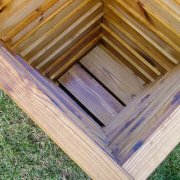 The wooden lattice obelisks can serve as a trellis for flowering vines like clematis and morning glory. The combination of roses and clematis weaving up a single obelisk, will form a wonderful focal point in your flower garden, while in the vegetable garden, beans and peas growing up an obelisk look attractive as well as being space efficient.